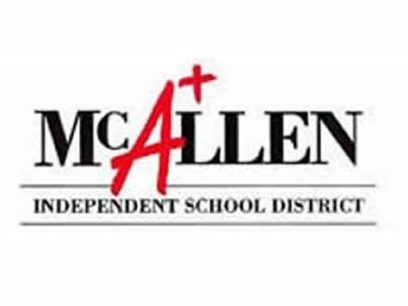 McALLEN — The board of trustees for the McAllen school district voted Monday afternoon to move forward with a special tax ratification election Sept. 8. The election received a unanimous vote from a full quorum to put the notion of maintaining a $1.155 tax rate but moving 11.5 pennies to the maintenance and operations side before area voters. Public school district funds from tax collections are divided into two buckets: Maintenance and operations, known as M&O, and interest and sinking, known as I&S. If left on the I&S side, these pennies are matched by the state at a lower rate, keeping the district from maximizing its value. The move, officials said, could yield up to $14 million in additional funding, which would allow them to fill a void in the M&O left by expiring disaster funding while also being able to cover the I&S portion to pay off debt. Without a TRE, school districts can only increase their M&O side to $1.04, but if voters approve a ratification, this side of the funding could go up to $1.17. The district was previously receiving $7 million in additional funding toward the M&O side due to several exceptions considered natural disasters. The money, officials said, is aimed at continuing to address maintenance needs, such as safety and security concerns raised by members of the community. This has so far included upgrades in safety doors throughout the district, adding adequate lab space in several campuses and continuing to address staff compensation, Superintendent Jose Gonzalez Gonzalez said during an interview in May. In this case, the district is only moving 11.5 pennies due to its tax rate falling short of covering the full increase to $1.17. But while the intention is to not increase the overall tax rate, passing the TRE would also mean voters giving the district permission to increase it to reach the full $1.17 in the future. This possibility was acknowledged by Gonzalez during presentations to various groups on the then-proposed election. And while he told the audience that the option would exist, he also pointed out that the district does not have a history of tax increases and has among some the lowest taxes in the county to date. Polls will be open for early voting from Aug. 22 to Sept. 4, with the exception of Labor Day on Sept. 3, and Election Day will be on Sept. 8. The district contracted with the Hidalgo County Elections Department for the special election, for which the county will utilize its countywide voting initiative, allowing voters to vote at any available poll during early voting and the day of the election. The board also moved to request polls to be open between 7 a.m. and 7 p.m., extending it one hour from the original request.